Fastload, the name itself telling that loads data in a fast way.That means it loads huge amount of data from flat file into EMPTY tables. 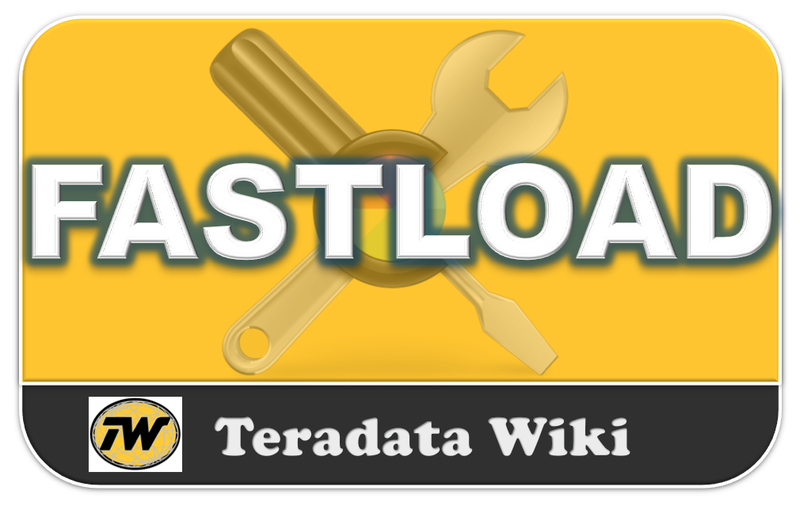 Manily FastLoad was developed to load millions of rows into empty Teradata tables so it is fast. FastLoad will create a Teradata session for each AMP in order to maximize parallel processing.This gives awesome performance in loading data. There are more reasons why FastLoad is so fast. Below are limitations of Fast load. 1) No Secondary Indexes are allowed on the Target Table: Usually UPI and NUPI are used in Teradata to distribute the rows evenly across the AMPs.Secondary indexes are stored in a subtable block and many times on a different AMP from the data row. 2)No Referential Integrity is allowed: The Referential Integrity defined on a table would take more system checking to prevent referential constraints. 3)No Triggers are allowed at load time: Fast load focused on data load with high speed. So triggers not allowed. 4)Duplicate Rows (in Multi-Set Tables) are not supported: Multiset tables are allowed duplicate data. Fastload can load the data into multiset tables but duplicate rows are discarded. As mentioned earlier target tables should be empty. Each FastLoad requires two error tables. These are automatically created during run. These will populated only errors occurred during the load. For example, if a column is defined as integer but the data from source the data is coming in CHAR format.i.e wrong data. The second error table is for errors caused by duplicate values for Unique Primary Indexes. FastLoad divides its job into two phases, both designed for speed. The primary purpose of phase 1 is to get data from host computer into Teradata System. The data moves in 64 K blocks and is stored in worktables on the AMPs. The data is not stored in the correct AMP. Phase 2 or Application Phase. Once the data is moved from the server, each AMP will hash its worktable rows. Telling the system to to insert data into final target. when can we RESTART fastlaod and cannot? AXSMOD to specify an access module (e.g., OLE-DB provider) that provides data to the FastLoad utility on network-attached client systems. SESSIONS max min to specify the number of sessions. max = maximum number of sessions that will be logged on. ERRLIMIT to control a runaway error condition, such as a mis-definition of the input data. Specify the maximum number of error records you want to occur before the system issues an ERROR and terminates the load. TENACITY to specify the number of hours FastLoad will try to establish a connection. The default is no tenacity. The statement must be placed before LOGON. SLEEP to specify the number of minutes FastLoad waits before retrying a logon. The default is 6 minutes. The statement must be placed before LOGON. Why fastload can not load duplicate records into table , whereas multiload can. If this feature was added it would mean more overhead/addidional space usage/slowing down the load and then it's no longer faster than MLoad. And why implementing this when there's already a tool (MLoad) which has this feature?